Samu Social’s mission is to contribute to improving the situation of street children in Dakar while upholding human dignity and in solidarity with the most vulnerable people. Falling victims of inegalitarian social development and chaotic urban growth, many people find themselves homeless and gradually become excluded from society. These people are ignored: with no shelter and no support or resources of any kind, they have no access to ordinarily available healthcare and social arrangements. Due to this situation of neglect as well as the very severe conditions of life on the street, homeless people end up disconnecting themselves fully from society, due to a mistrust of institutions and society at large. The overall objective of improving the lives of street children in the city of Dakar therefore implies involvement in the development of actions specifically suited to this social issue and to the needs of the most vulnerable excluded persons. Deprived of protection and affection, with no family support, street children are excluded from healthcare, social and educational structures and are too weak or too desocialized to decide to turn to existing support facilities. Their state, both physical and psychological, therefore deteriorates very rapidly, especially as they face very harsh living conditions. They have no other choice but to develop a street survival strategy by creating new bearings, namely joining a group of children and identifying to a specific street territory. These specific features help understand the behaviour of street children, who prefer to stay on the street, where they have their own bearings and feel safe, rather than seek help. 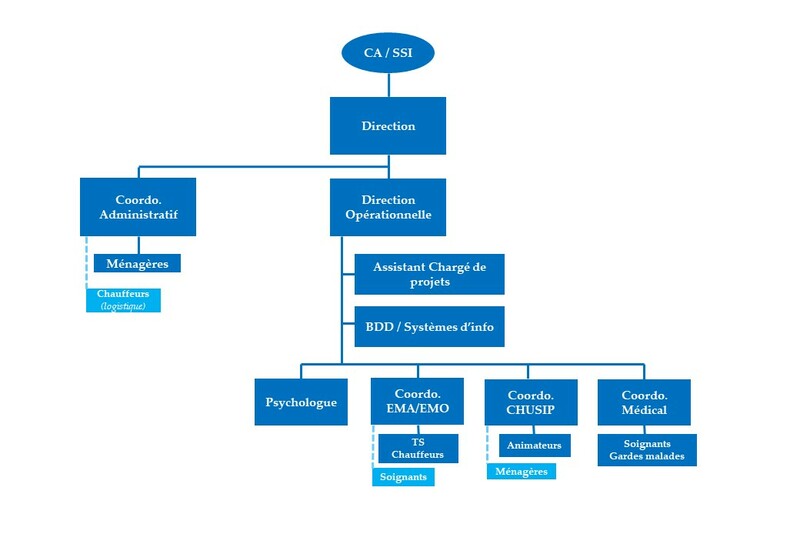 Created in 1998 by Doctor Xavier Emmanuelli, Samu Social International is an emergency intervention mechanism which reaches out to the most desocialized people who have been pushed into a state of basic survival, as they have become “victims”, no longer able nor willing to seek ordinarily available assistance. All major cities of the world, both in the West and in developing countries, generate social decohesion, a loss of meaning, physical suffering, addiction, distress, and it has therefore seemed important to offer a globalized response, ahead of institutional frameworks, in order to help victims of these phenomena. Samu Social Senegal is legally registered association at the Senegalese Home Ministry under reference 002988 of May 9th, 2003, and it secured an NGO Agreement in February 2009.
with the City of Dakar. Upon request by the President of the Republic of Senegal, a Samu Social International mission, led by its Chairman, Doctor Xavier Emmanuelli, arrived in Dakar in April 2002 to conduct a feasibility assessment on implementing an emergency support mechanism for the most vulnerable street children, in order to provide them with the most adequate medical, social and psychological care and to give them a shelter. In June 2002, a second mission helped to fulfil this political will (President’s Office, Ministry of Health) and to meet with various institutional and associative partners (hospitals, Mayor’s Office, associations, etc.). 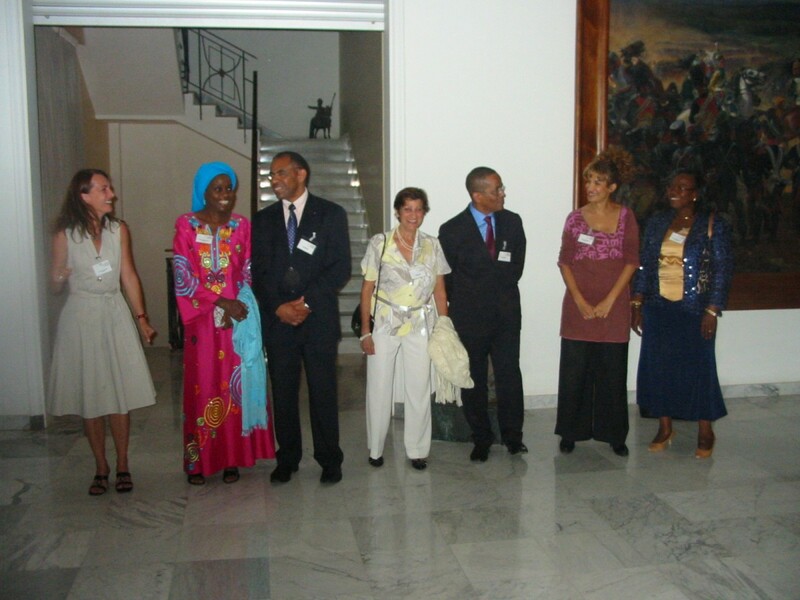 In January 2003, Samu Social International conducted a third mission in order to back the creation of Samu Social Senegal. Samu Social Senegal is a statutory member of the Samu Social International Charter, while Samu Social International is a member of the Senegalese association’s Board of Directors. 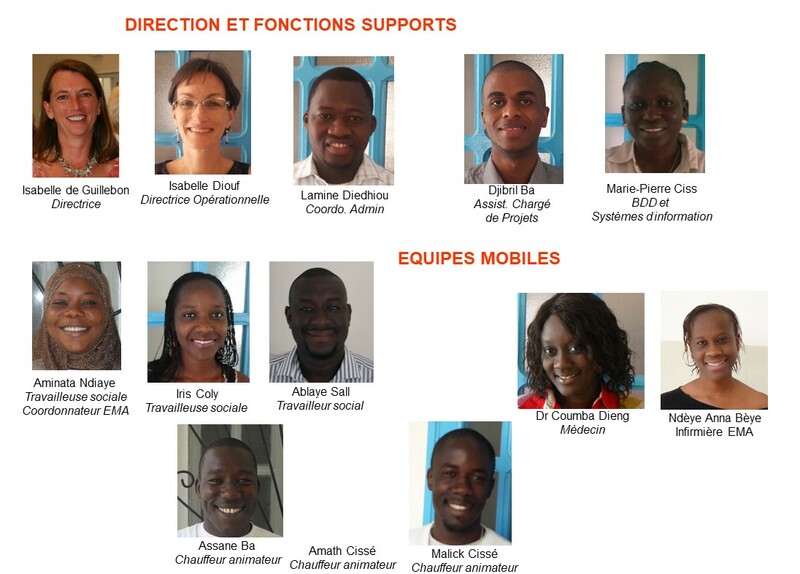 Just like Samu Social Paris and the local “samusocial ” chapters in Brussels, Bamako, Ouagadougou, Algiers, Casablanca, Moscow, Bucharest, Lima, Cayenne, Pointe Noire, and Lunda, Samu Social Senegal belongs to a network led by Samu Social International. In this respect, Samu Social Senegal is signatory of a partnership convention with Samu Social International, which governs the collaborative framework and conditions between the two entities. As Samu Social International is the legal bearer of the “samusocial ” name, it reserves the right, in case the partnership agreement is terminated for serious reasons, to withhold any payments allocated by Samu Social International to the Samu Social Senegal programme and to withdraw the Samusocial name from the local association. Urbanization leads to social break-up: cities are attractive because of the possibilities (economic or cultural) that they offer, but they also have an impact on the fabric of community and family relationships. For the most vulnerable, this translates into exclusion. A person experiencing exclusion becomes a victim removed from the gaze of others, but also from that of institutions, having lost in this life on the margins the codes of collective life: loss of family and societal relationships, loss of the sense of time, of space and body, often heightened by addiction to toxic substances to make way for the sole requirement of survival. This is not irreversible. Samusocial is fighting against this phenomenon. Samu Social International is a French association founded in 1998 by Dr. Xavier Emmanuelli, which supports local development initiatives in the framework of fighting against the social exclusion of the urban homeless. Samu Social International now partners with twelve national Samu Social chapters, including eight that are specialized in the issue of street children. Samu Social International developed a specific action model in the framework of the fight against social exclusion in the urban setting, based on a social emergency method which consists in “reaching out to” people living on the street and, according to their specific situation and wish, “guiding them towards” shelter, housing and/or healthcare entities that can address their specific needs. The Samu Social Senegal entity belongs to the Samusocial International Network and abides by the Samu Social International Charter. Through its technical expertise as well as financially, Samu Social International supports the efforts of Samu Social Senegal. It regularly sends assessment missions and holds an annual coordination meeting with all Samusocial structures, which is an opportunity to share experiences and ideas. The Board of Directors is made up of 7 members elected by the General Assembly for a renewable 2-year term. They meet at least 3 times per year. 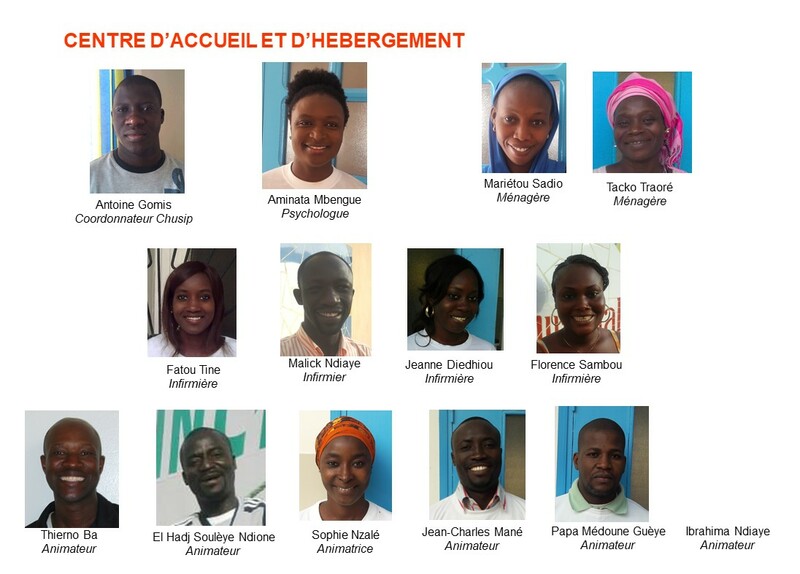 Some are her since the pioneering days, others joined the team along the way, and others went to live new professional adventures; each brought his/her will, motivation, knowledge, experience … In short Samusocial Senegal is a living structure. To better put faces to names, here are the current teams in pictures. In 2018, a total of 28people are employed by the Samu Social. while reaffirming the principles of Freedom, Equality, Fraternity and Solidarity. Federated within SAMU SOCIAL INTERNATIONAL, SAMUSOCIALS are rescue mechanisms which seek to reach out to vulnerable people in the world’s large cities who are too weak or disenfranchised to express their own needs, and to provide them with Help, Comfort and Assistance. They are the first link in a chain spanning from emergency to insertion. Each SAMUSOCIAL is connected both to formal medical, psychological and social institutions as well as to associations and organizations working in these areas, and to instances, private or institutional, that fight against exclusion. Through its action, each SAMUSOCIAL also engages with and gives a sense of purpose to the people it seeks to help. This is why it somehow represents an intangible refuge – an out-of-doors refuge. Preserving and restoring the dignity of people in physical or social distress. This value implies that each SAMUSOCIAL should, without any discrimination, reach out to and open up to vulnerable people who no longer have the strength and the means to send out their own request for help. It means that help and assistance should be offered tactfully, alongside shelter or social accommodation and/or medical care as required. Ensuring that the people cared for receive the medical and/or social protection that they need. Acknowledging this right implies the provision of care without qualifying conditions and, for all, the search or even securing of all existing rights and solutions consistent with their state. It therefore means that solutions should be sought for medium or long-term accommodation solutions, entry into a solidarity network and access to immediate, preventive, curative and palliative care consistent with the situation of these people and the degree of urgency determined by their state. Finally, each SAMUSOCIAL should provide for the possibility of establishing the necessary contacts between the people hosted and the relevant health and social institutions and organisations. Ensuring that the people rescued have access to information and fully enjoy their civic rights and duties. Promoting access to this right implies that each SAMUSOCIAL helps people in its care to find the means to recover a civic or administrative identity and to access information in order to break out of isolation. Enabling all rescued people to take full cognisance of their rights in order to legitimately exercise them and to take part in social activities and in the exchanges which underlie the dynamics of a life of freedom and dignity. Reaching out to vulnerable people and providing an effective and suitable response to their needs. In providing assistance and rescue, each SAMUSOCIAL should endeavour to cover all aspects pertaining to basic human needs. Mobility should be employed in order to reach out to those who have been excluded for too long and no longer have the strength to ask for help. Finally, each SAMUSOCIAL should commit to using only professionals or trained staff, whether volunteers or salaried. The Samusocial Professional Code of Conduct was adopted by Samusocial International Board of Directors on September 7th, 2006, and by the Samusocial Senegal Board of Directors on November 7th, 2006. It seeks to define the duties of Samusocial collaborators in the framework of their activities with people, minor of adult, who are beneficiaries of the action programme. – any person bound by an internship agreement, volunteer agreement, as well as any participant to Samusocial activities (namely visitors and street tour support staff). – complying with the principle of confidentiality regarding medical, psychological and social information on beneficiaries as well as the principle of anonymity. – termination of volunteering duties.